Long-running text message threads, particularly ones that might be filled with pictures, will quickly take up space on an iPhone. 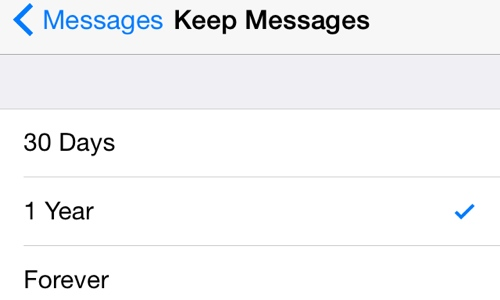 Apple has addressed this problem in iOS 8 by adding a new "Message History" setting. Users can customize this by launching the Settings application, choosing Messages, and then changing the "Keep Messages" option. The available options are 30 days, one year, or forever. Selecting 30 days or one year warns users that the setting "will permanently delete all text messages and message attachments from your device" once they reach the expiration date. For threads that remain active, Apple has made it easier than ever to go back and view older attachments and access other unique functions. These are available by hitting the "Details" menu in the upper right corner of a message thread. From here, users can scroll down to the "Attachments" section and see a collection of pictures, video and any other media that may have been sent. Users can also name a group message thread if they choose. iOS 8 also allows users to send their current location to members of the conversation, or share their location for three different time options: one hour, until the end of the day, or indefinitely. Finally, for conversations that might be particularly bothersome or unwelcome, Apple has also added a Do Not Disturb switch. Enabling this will mute notifications for an ongoing conversation, ensuring that the user's phone is not constantly buzzing from new messages. And if a group message thread has become absolutely unbearable, a new "Leave this Conversation" function is also included in iOS 8. All of these features are in addition to the new quick sharing functions for sending audio, video, images and text in iOS 8, as also detailed by AppleInsider. 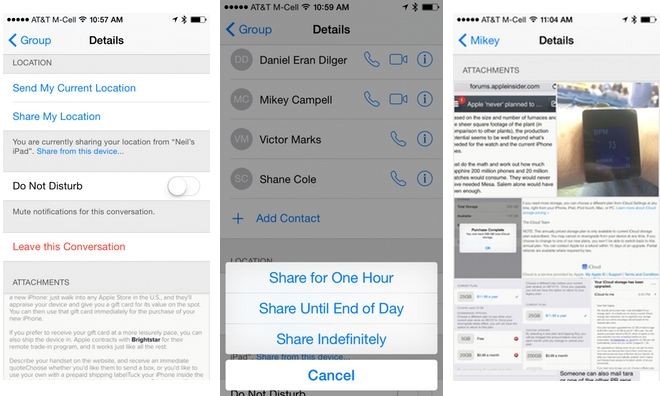 For more, see our full list of tips for getting the most out of iOS 8.